Preparing fluffy scrambled eggs sounds like it should be fairly simple, but there is a lot of controversy in the cooking world over the best way to achieve that fluffy, light texture. It all comes down to finding out what works best for you and your taste buds—but there are several how-to tips you can follow to attain tasty scrambled eggs, from when to season them to adding in cream or ****er. Invest in a nonstick pan. Avoid using cast-iron or stainless steel pans when you cook your eggs—they’re much more likely to stick and burn. Use a small nonstick pan for cooking 1-4 eggs, a medium sized nonstick pan for 4-6 eggs, and a large nonstick pans for 6 or more eggs. Don’t use metal utensils in a nonstick pan, as they will sc**** and scratch the nonstick coating. Stir your eggs with a silicone spatula. Avoid using metal utensils, wooden spoons, or any utensil that has a firm edge because they won’t be able to fully sc**** the sides of the pan as you cook. 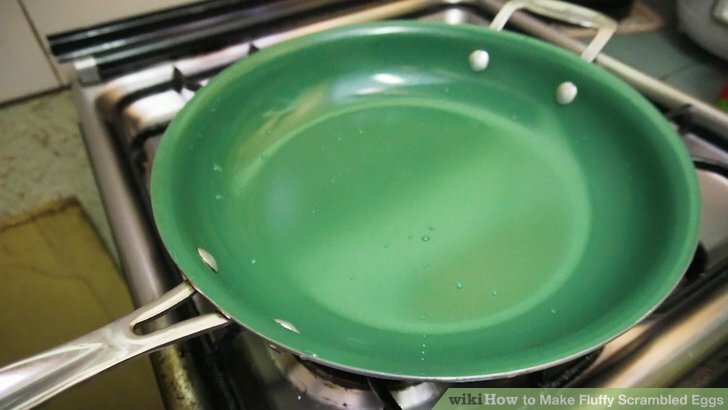 When you stir, make sure to sc**** the sides of the pan, the bottom, and especially that little corner where the sides connect to the bottom. If you don’t have a silicone spatula, a wooden spoon is the next best option; it’s less likely to scratch your non-stick pan than a metal utensil. Add milk, cream, or crème fraîche for creamier, fluffier eggs. Add more liquid if you want your eggs to be creamier, and less liquid if you prefer a firmer scrambled egg. Use about of liquid per egg you are cooking. 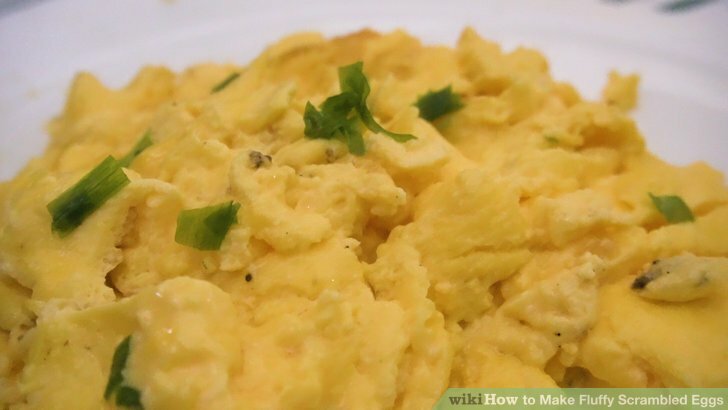 Whole milk and cream give a better texture to scrambled eggs than non-fat milk. Season your eggs right before they finish cooking. Wait until your eggs are just a little bit runny still, and then sprinkle on your salt and pepper. Some cooking aficionados claim that seasoning the eggs too early will make them watery and rubbery. Some experts say to season the eggs before they even go into the hot pan. This is one of those areas where you’ll have to test it out to see what you like the best, as there is more than 1 way you can season your eggs. Crack the eggs directly into the pan. Or don’t. This is another area where experts are split. 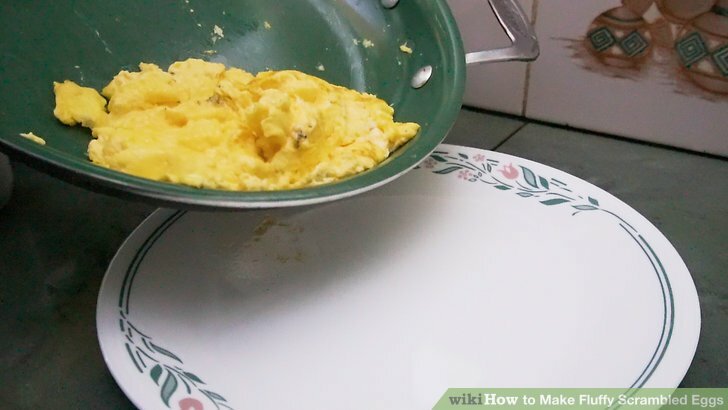 Try it out both ways—cook scrambled eggs by cracking the eggs directing into the pan, and cook them by cracking them into a bowl and whisking them together there first. Try it out to see which method you prefer, then you can speak with confidence when making your own scrambled eggs. Remove the eggs from the heat right before they finish cooking. When the eggs are mostly cooked but still slightly runny, take them off the heat. The residual warmth from the pan will finish cooking the eggs the entire way, whereas if you left them on the burner a little longer, they would start to dry out and get less fluffy. If you accidentally take your eggs off the heat too soon, just turn your burner back on and continue cooking the eggs for another minute. Add in tasty toppings, like cheese, chives, or even chopped olives. Wait to add your toppings until you’ve removed the eggs from the heat. Then, just before you transfer the eggs to your plate, sprinkle your topping onto the eggs. For cheese, the heat from the eggs will help it melt and meld to the eggs. If you’re hosting a brunch, you could even have a variety of toppings available for your guests to choose from, like chopped ham, olives, shredded cheese, fresh basil, chives, and a myriad of hot sauces. Chop your chives and set them to the side. Use a sharp kitchen knife and a clean cutting board, and finely chop your chives. You can make the chive pieces as small or as big as you like, depending and what you prefer. Set the chives to the side in a small bowl. Wash your hands after chopping the chives to remove the onion smell. Crack your eggs straight into a deep, unheated saucepan. Crack the eggs either on the counter or on the side of the saucepan, and deposit them straight into the pan, rather than first putting them into a bowl. Put the shells down the garbage disposal or add them to your compost pile. Depending on your preference, if you’re a “whisk before cooking” person, go ahead and crack your eggs into a bowl and whisk them until they’re incorporated. Use cold eggs if you can for a better texture. Put the cubed ****er into the pan along with the eggs. Use about of ****er, and add it right into the unheated pan along with the eggs. You can cut the ****er into smaller chunks if you prefer, though the eggs and the ****er will all get mixed together fully in the end regardless of the size of the ****er at the beginning. Your ****er can be cold or at room temperature. Turn the burner heat to high and continuously stir the eggs. Use a silicone or rubber spatula to break, mix, and move the eggs. It’s very important that you keep them in constant motion to ensure they incorporate together and don’t become streaky. If you prefer to whisk the eggs together ahead of time, simply whisk them in a bowl before adding them to the pan along with your ****er. Lift the pan off of the heat every 30 seconds for 10 seconds at a time. Continue to stir the eggs the entire time the pan is off of the heat. So you will heat the eggs for 30 seconds, remove for 10 seconds, heat the eggs for 30 seconds, and so on, until you’ve cooked the eggs for about 3 minutes or until they are silky, light, and just very slightly runny. As you stir, make sure to sc**** the eggs from the bottom, the sides, and the corner where the sides intersect with the bottom to ensure none of the eggs burn. Season the eggs and add the crème fraîche right as they finish cooking. Add a pinch of salt and pepper and a small spoonful of crème fraîche (about will be adequate) into the eggs and stir until everything is incorporated together. You can use sea salt or regular table salt, whatever you have on hand is fine! Remove the eggs from the heat right before they finish cooking. When you notice that the eggs are silky and smooth, but still slightly runny, turn off the burner and also remove the eggs from the heat. The residual heat of the pan will continue cooking the eggs. Continue stirring the eggs even after they’ve been removed from the heat. Transfer the eggs to a plate and garnish with the chopped chives. You could serve the eggs on top of toast or potatoes, and sprinkle as few or as many chives as you prefer. Eat the eggs immediately after they finish cooking for the best taste and fluffiest texture. If you don’t like chives, consider using fresh basil or adding some shredded cheese. Try to use organic, free-range eggs when you can, as they will have a better flavor. Try making scrambled eggs a few different ways to see which you prefer: salt your eggs before they cook or just as they finish cooking; whisk your eggs in a bowl or directly in the pan; cook your eggs over medium-low heat or use high heat with frequent stirring.